Not only will your child thoroughly love his music class, you will love teaching him with these easy-to-follow instructions that make music fun! This spiral-bound Teacher Edition will be just what you need to assist your child in gaining a lifelong foundation for understanding and appreciating music. 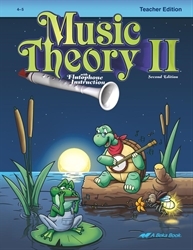 Lesson plans incorporate Music Theory II Digital Teaching Aids (sold separately).Gr. 4–5. Quick grading! This teacher edition includes a copy of the student work-text with answers to the questions and activities in your child’s book. Grading your child’s work is quick and easy! Detailed lesson plans. You can know exactly what to teach your child for the 30 minutes of each of the 34 once-a-week lessons. Lesson elements include review, new concepts, workbook exercises, sight singing, flutophone playing, and listening exercises from classical pieces. A preparation section makes sure you are ready for each lesson. Teacher’s notes. Includes a “Scope and Sequence” to give you a sequential overview of concepts taught throughout the year. Other bonuses include a Christian philosophy of music, course goals, and specifics for each element of a lesson. Directed guidance with your own copy of the student text. Learning music can be so much fun when steady progress is achieved. By following along in your own copy of your child’s work-text, you can help your child find success with rhythms; improve his flutophone playing, complete activities in his student book, and sight-sing unfamiliar music. Listening/visual aids. Your child will learn familiar clue songs to help him identify note intervals from a second to a full octave by their sound. Music flashcards are provided to reinforce the concepts that your child is learning and to drill areas that he needs to develop. The lesson plans indicate when to use each aid.